While I may have recently purchased a new set of tires for my truck, I decided to put a few miles on a set of retreads in Louisiana. Now you may be thinking, “Really George, all you had to do was ask. I would have pitched in and helped you get something better than retreads.” (Of course you were thinking that – not!) No matter, the retreads I refer to are none other than my long time, but never met, brothers from another mother, John Donewar and David LeBlanc. We are the “retreads” because we all have a few miles on our tired worn out bodies, and are all in need of retreading. 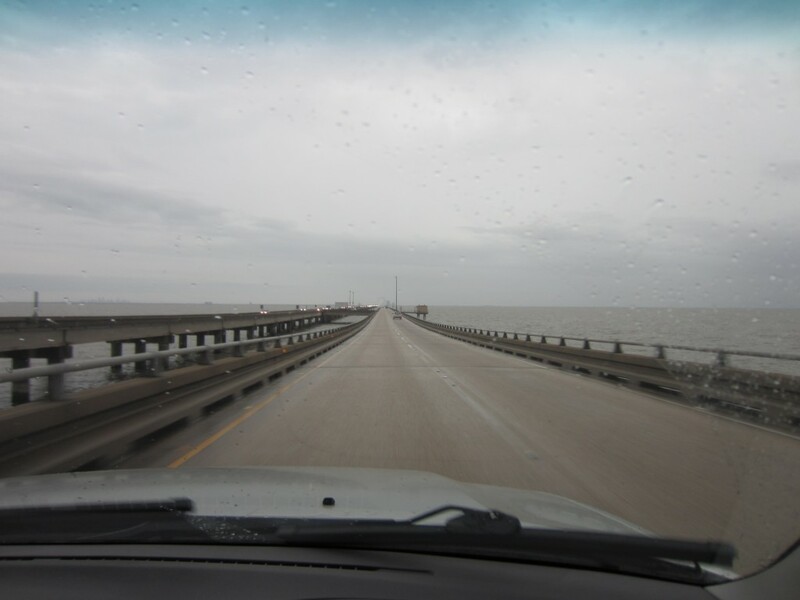 In the morning John and I set out across the Lake Pontchartrain Causeway to pick up David for a day of hiking. The causeway is the longest bridge in the world at just under 24 miles long, and gave us plenty of time to share in the word. Since it was April 5th I started out in Proverbs 5, and the warnings about the adulteress quickly led us to 2 Samuel 11 where we talked of David and Bathsheba. Needless to say, there is comfort in knowing that God uses men with “a broken spirit; a broken and contrite heart you” (Psalm 51:17) When you go looking to serve in God’s kingdom the sign on the door says “Perfect people need not apply”. After arriving at David’s and heading into town for breakfast, we set off in search of a hike. 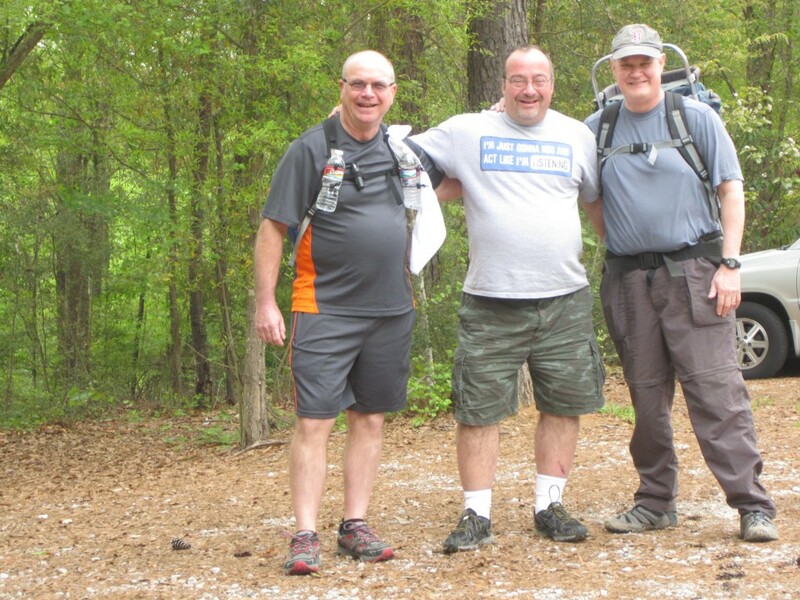 By now we were all feeling better, but were glad not to have to deal with the upcoming bad weather on the Natchez Trace. 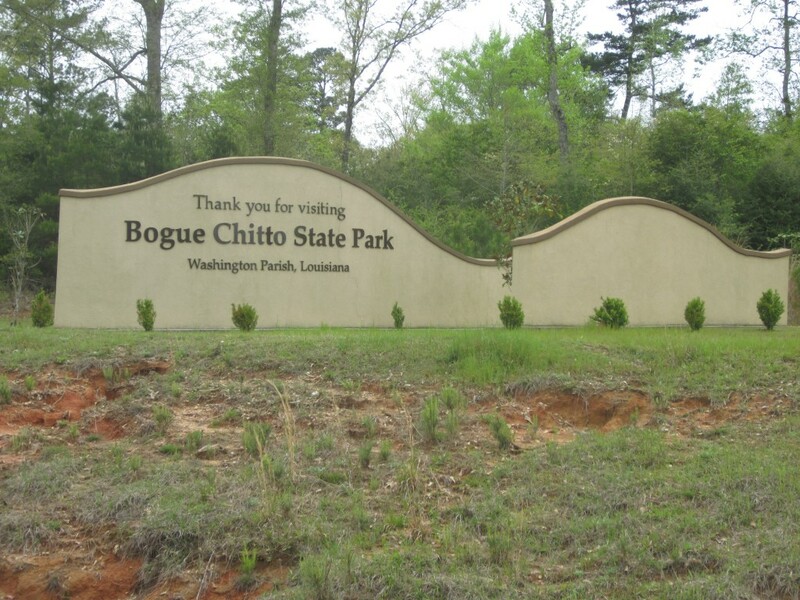 We landed at Bogue Chitto State Park in Washington Parish, and quickly arrived at the Gorge Trailhead. 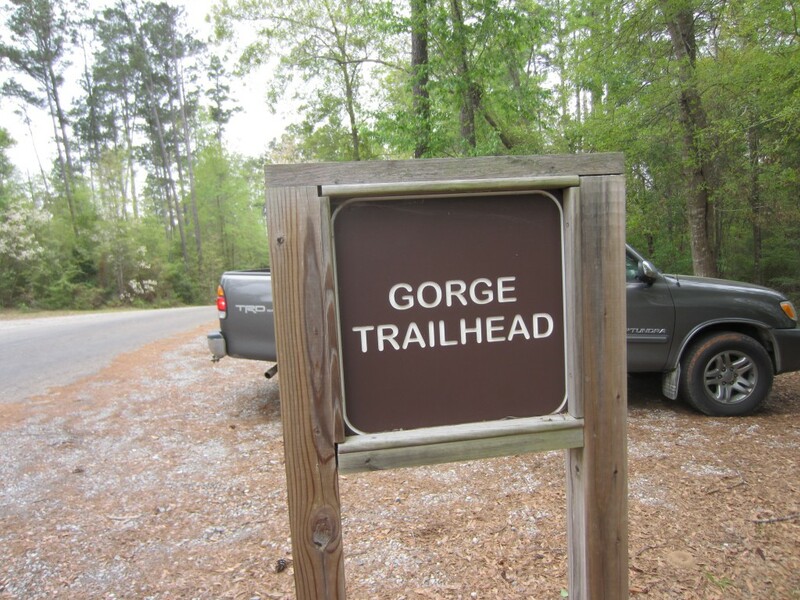 The park and it’s trails offer some nice hiking and camping options and a few amenities I’ve never seen at home. 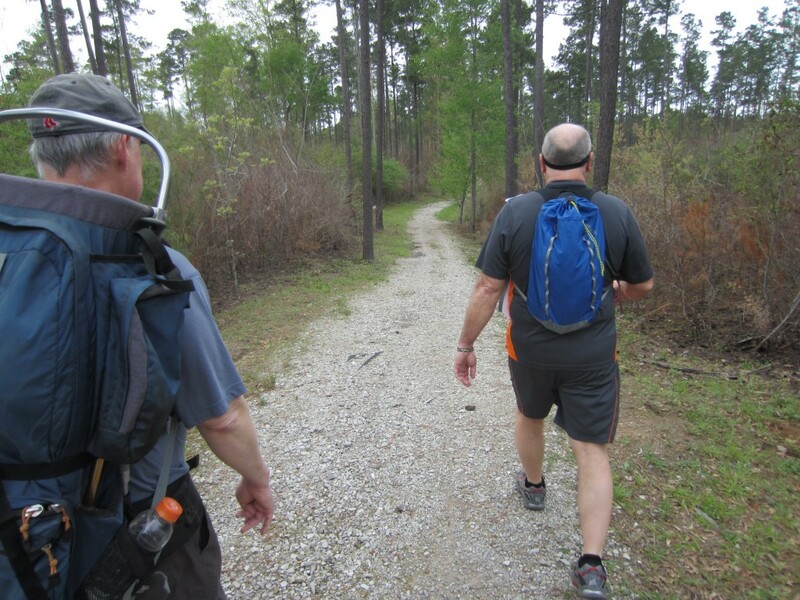 The trails were very pleasant for hiking, and wide enough to walk two or three wide and talk. Any worries of pain and suffering disappeared as three friends shared stories and good natured ribbing, mixed in with lots of belly laughs. If you didn’t know any better you’d think we had been hiking together all our lives. We hiked until the trail started to become ridiculously slippery and muddy, then started back to the trail head. 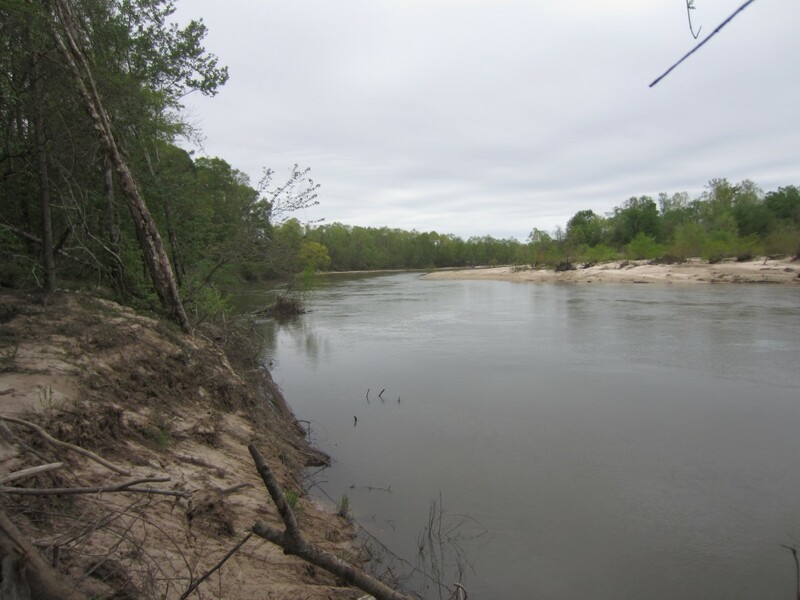 At one point I stopped to take a picture of the Bogue Chitto River, and slipped and fell in the mud. My initiation into the Retreads was complete now that I had a Louisiana mud bath! At one of the road crossing a nice lady flagged us down and we thought she had car trouble. Turns out she just wanted to show us some nesting Night Herons she spotted in the forest. I’m not much of a bird watcher, but it was pretty cool to see. Before we knew it we were back at the trail head and another adventure was over. We visited a while with David and his wife Barbara, and all too soon departed my new “old” friend. As I write I am still visiting with John and Cheryl, and tomorrow will be a sad adieu. It, however, is not good bye, but, à la prochaine fois – until we meet again.